Ever wonder what your pets really think about the holidays? You may be asking--what could they possibly be “thinking” about at all?! As an Animal Communicator, I can assure you, there is no question whatsoever that animals have thoughts. And what about all the excitement (aka “stress”) over parties, bringing home packages/gifts, guests arriving, and the hustle-bustle of all that holiday time involves? It’s one of the most special times of the year — but some household changes can cause distress in our pets. Animals are creatures of habit, and disruptions to their daily schedules can result in behavioral changes or health issues. Possible scenarios include toileting in inappropriate places, unusual aggressiveness, or eating concerns. With almost 12 years of experience listening to and talking with animals, I have heard some very interesting stories. I recall a request from a returning client who contacted me just after Christmas. 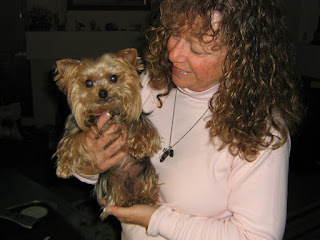 Her 10-year old Yorkie suddenly became lame, with no apparent cause. When I spoke with little Tiger, he explained that on Christmas, he overheard a visiting family member commenting on how much he had aged. Consequently, he believed that he must be so old, that he couldn’t walk! After doing some energy healing on him, I explained that he was completely able to walk again…and he did! Just like we humans have different reactions to stressful situations, so do the animals. The best we can do when new or stressful situations occur in our lives, to help our pets stay healthy and happy, is TALK to them! Explain as you would with a young child exactly what you expect to take place. Bonnie Taplin is an intuitive and caring Animal Communicator who is available for affordable consultations to pet parents by telephone or in person. For more information, please call Bonnie at (949) 636-5500 or visit her website www.bonnietaplin.com Wishing you and your pets a safe and happy holiday season!